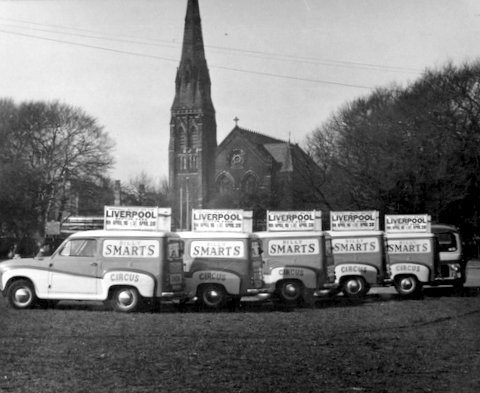 In the foreground the line of Austin A30 vans is clearly advertising the Billy Smart’s Circus that’s about to take place on the field. And looking around I’ve come across this extraordinary photograph. 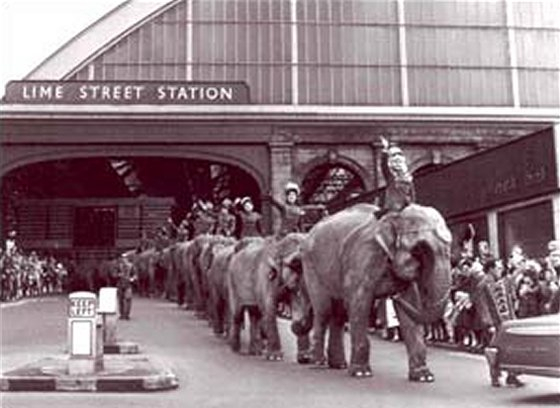 Elephants leaving Lime Street Station, 1959. Bound for Billy Smart’s Circus. So I think we’ve established the year of your picture Stan! Same riders, same lead elephant, back of same car – 1966. 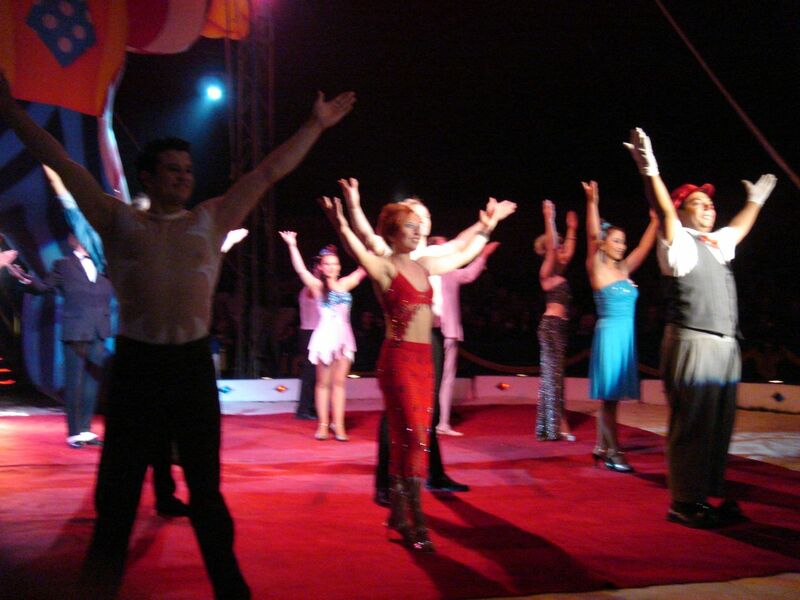 Anyway, long after such magnificent ceremonial parades the circus has returned to what now seems to be spelled the Review Field in recent years, though without the elephants. And in October 2007 Sarah and our friend Bren went to see it. And what of the church in the background of Stan’s picture? 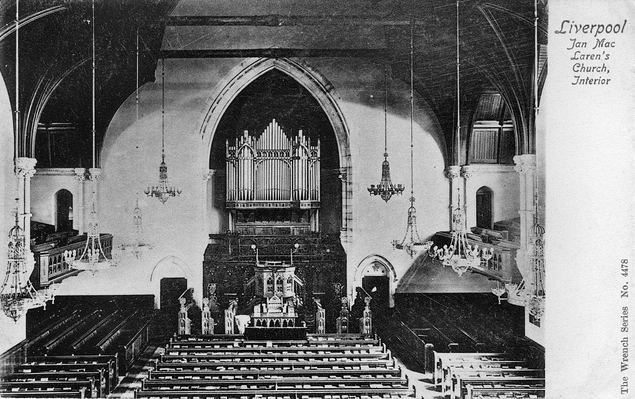 Well it was the Sefton Park Presbyterian Church, built in 1879 and demolished in 1980. Here’s a lovely post card of it. I remember the church from my early days of walking in Sefton Park. In fact it was only when Stan sent me the photograph I fully realised it had gone. And over 30 years ago. 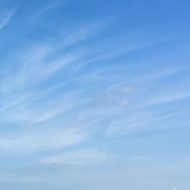 We notice arrivals, but even the departure of something so grand can pass us by. 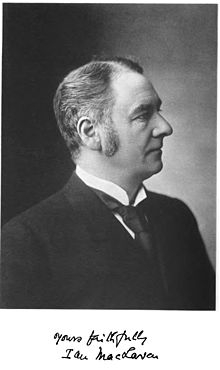 And what of the field itself, the Review Field? 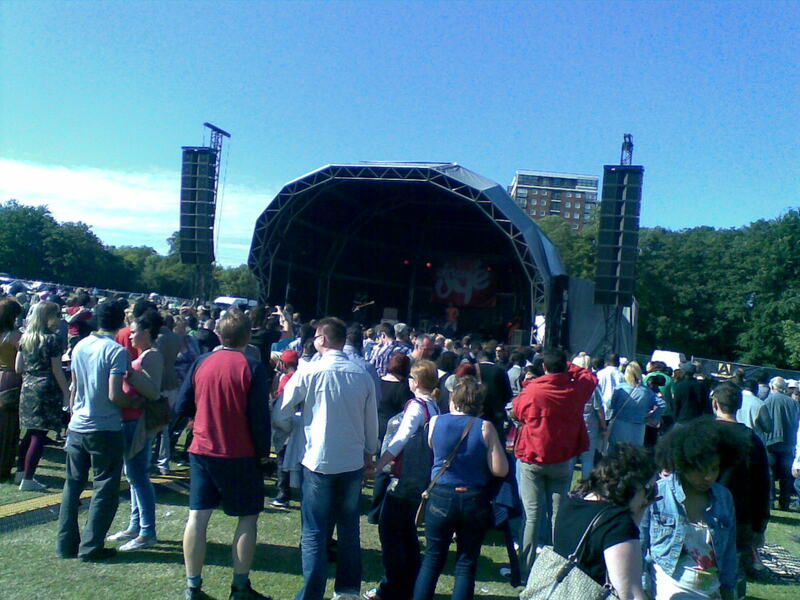 The largest of Sefton Park’s many grand open spaces. 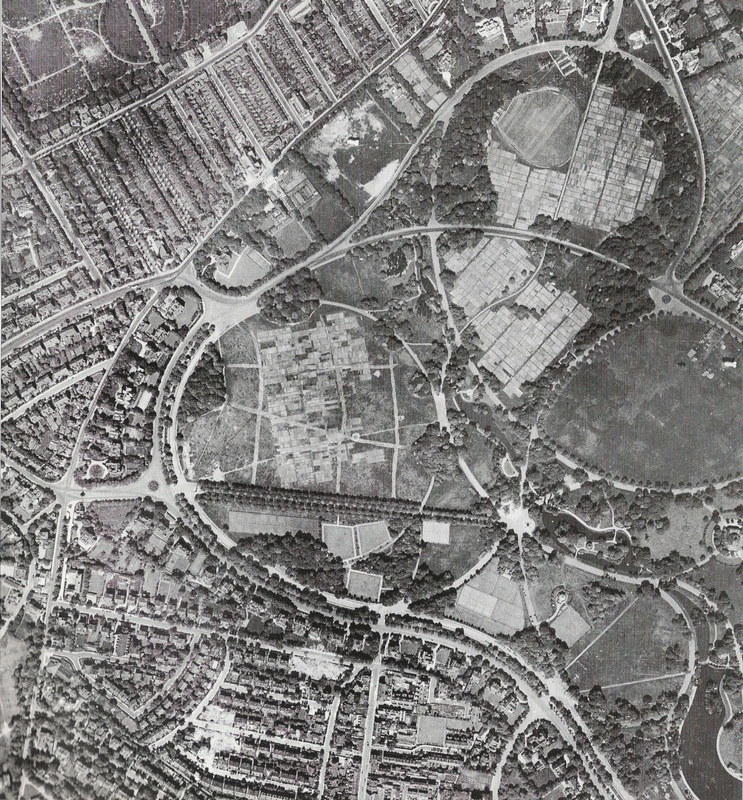 Before Stan’s picture, during World War Two, it had been used for allotments during the ‘Dig for Victory’ campaign. Thanks to Mr Seel’s Garden and the City Council for the borrow of this aerial photo. 1941. The Review Field is on the left. 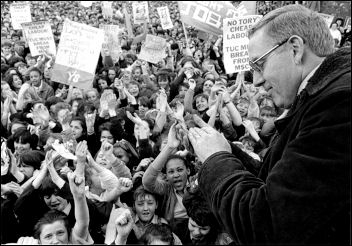 Then, around the time the church was being demolished the Review Field would often be where many of us would go for the start of the major unemployment marches, campaigning against Margaret Thatcher’s government’s destruction of the industrial base of our country. I went to a series of them, in 1980 and 81, Liverpool, Glasgow, Birmingham and London. But the one I remember most started here on the Review Field. 100,000 of us were there that day, we told ourselves. 50,000 said the police. That was always the way, arguing about numbers. 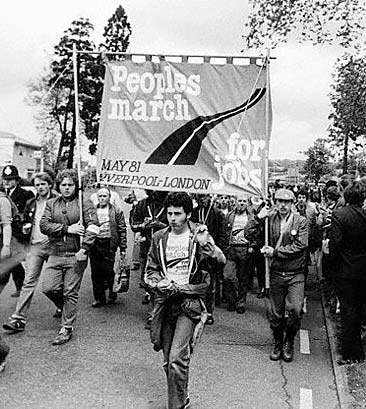 All I know is our Union Branch hadn’t left the Review Field by the time the head of the march reached its end at the Pier Head. It was a lot of people. Whatever, soon the Falklands War came, and all our efforts, on the Review Field and beyond, couldn’t stop the Tories staying in Government for a further 16 years. More recent years have seen the Review Field being used for what I believe to be Liverpool’s greatest outpouring of joy and confidence in itself. Our annual party and my own personal Christmas, the Africa Oyé Festival. Two perfect midsummer days a year celebrating, for free, the music of Africa. Wherever it’s ended up. Africa Oyé 2008. 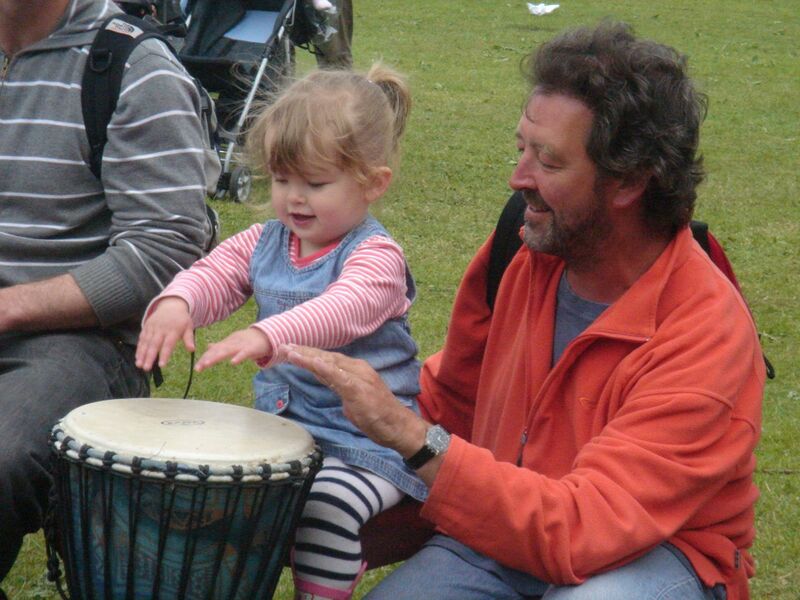 My granddaughter Ellie learns to drum. First drum, the previous year. And then in May every year, the Review Field has been the start and end of the Women’s 10k run. (Though I can’t find a link to it for this year, can anyone help?) Sarah’s run this many times over the years, most memorably in 2010 to celebrate the end of her major breast cancer treatments. 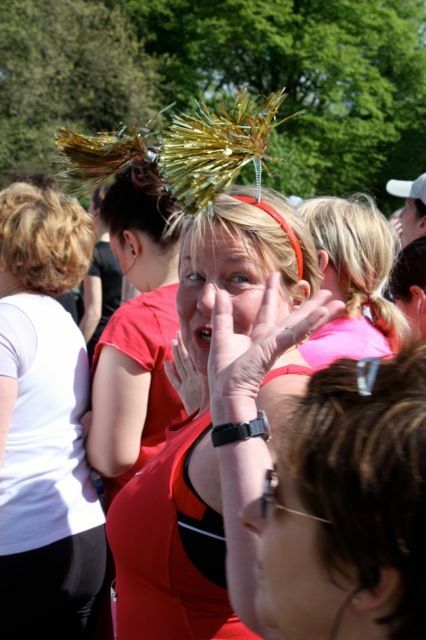 May 2010, at the start of the Women’s 10k. 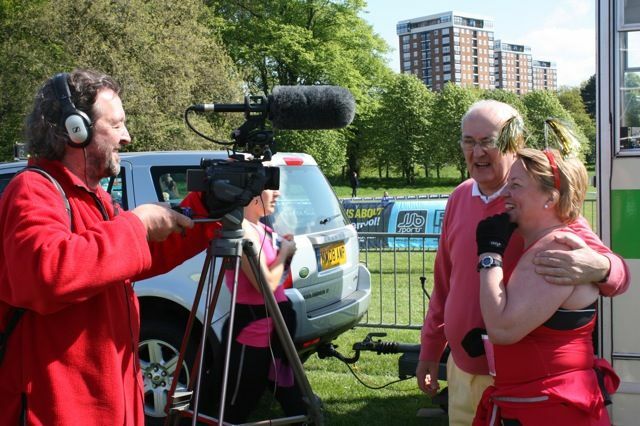 Interviewed by Radio Merseyside, filmed by me. And what of today on the Review Field? Well today is more typical of what most days are like for it. Not much happening, about to rain. 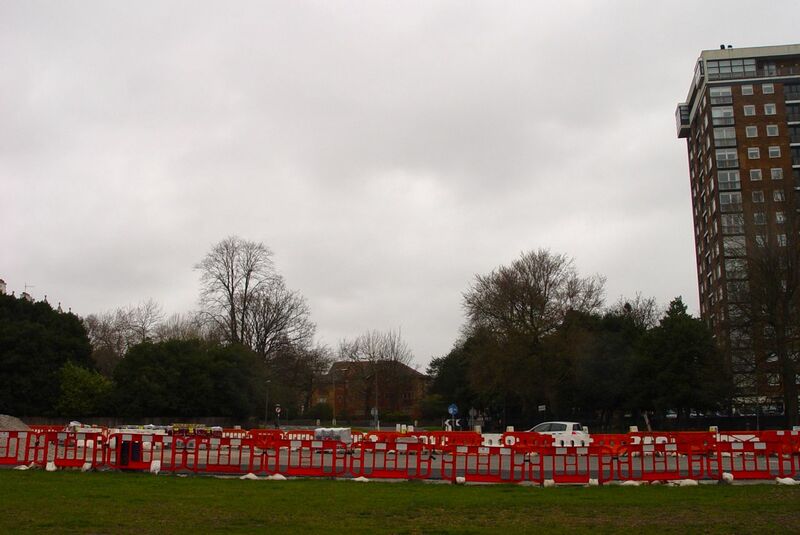 Roadworks are taking place, tower blocks have turned up, the church has gone and there are no Austin A30s advertising a circus. The circus was here a few weeks ago though, for the Easter holidays. But what’s replaced the church? Not such a striking corner feature as the church was. 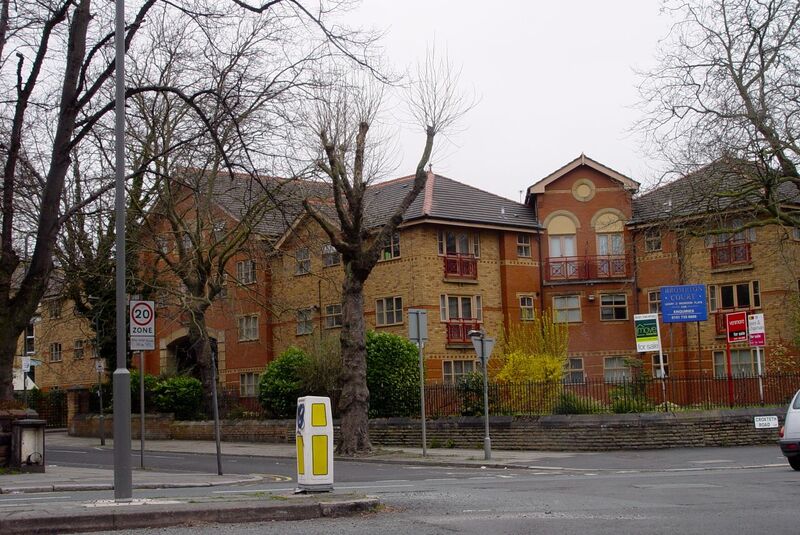 Brompton Court. Only the stones from the old churchyard wall retained. Still, it’s a rich meditation from sitting here staring at the picture Stan sent me. But what of the future? Whist walking round to the Review Field I saw these notices on lots of lamp posts. 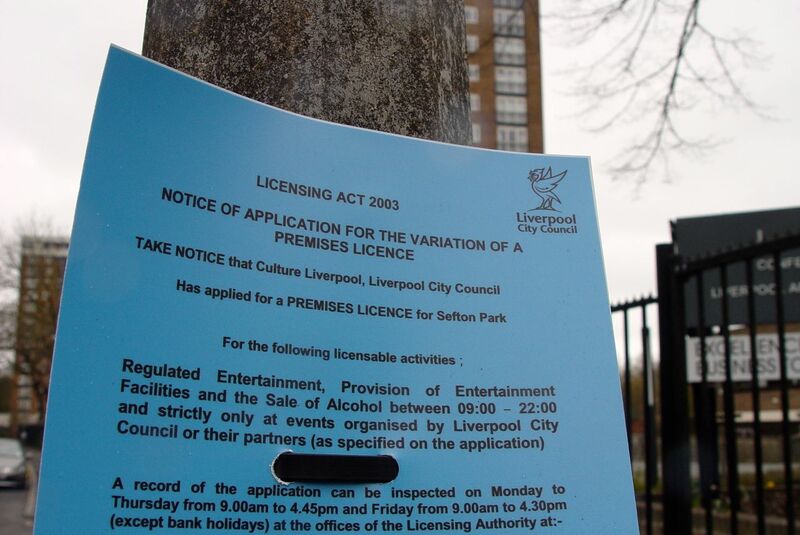 Yes, looks like the Review Field and the rest of the Park might be about to become a serious ‘Venue.’ As in ‘entertainment and alcohol’ from 9:00 in the morning? Come on, we like a party in Liverpool but we usually like to get breakfast and even lunch out of the way before we start. Oh well, the Review Field will survive. It always has. Thanks for the photo, Stan. Thank you so much Ronnie, that’s fantastic. 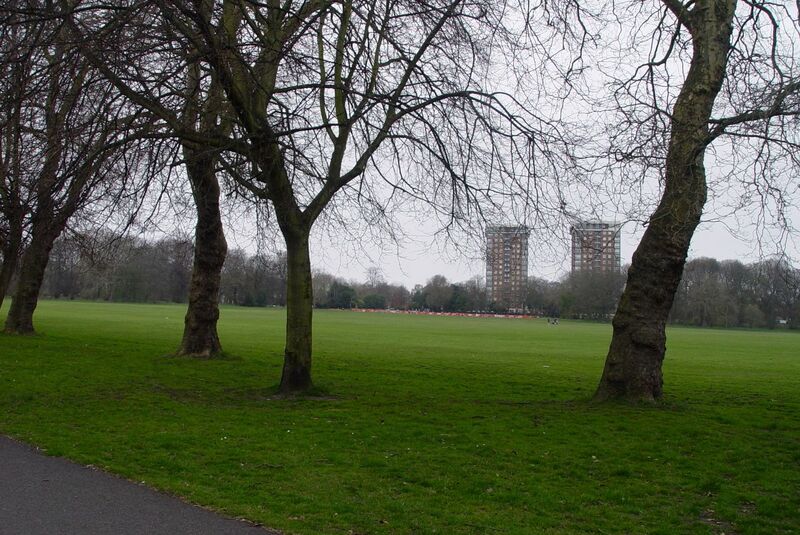 That field played such a large part in our childhoods. We played there, we went to the circus there and we went to the fairground there. Along part of it from the Needle to the Cafe there used to be barrage balloon sights during the war of course. And I’ve a feeling there was aa (anti aircraft) guns there as well, but I can’t swear to it. Great that between us we can put together over 70 years of memories of such a quietly significant Liverpool place. Keep the photos coming Stan, wherever it is you’re digging them out from! Thanks for an interesting set of photos. I learnt to drive in an old Austin A30 van. The Church’s successor, Toxteth and Sefton Park United Reform Church based in an old house on Ullet Rd has now also recently closed. 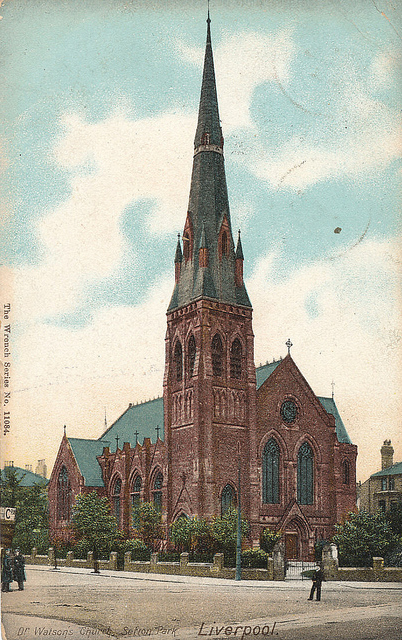 Sefton Park Presbyterian Church was reputed to once have had the wealthiest congregation in Liverpool. Curiously Liverpool estate agents claim this area is in Aigburth !!! This seems to be because the area has a L17 post code. 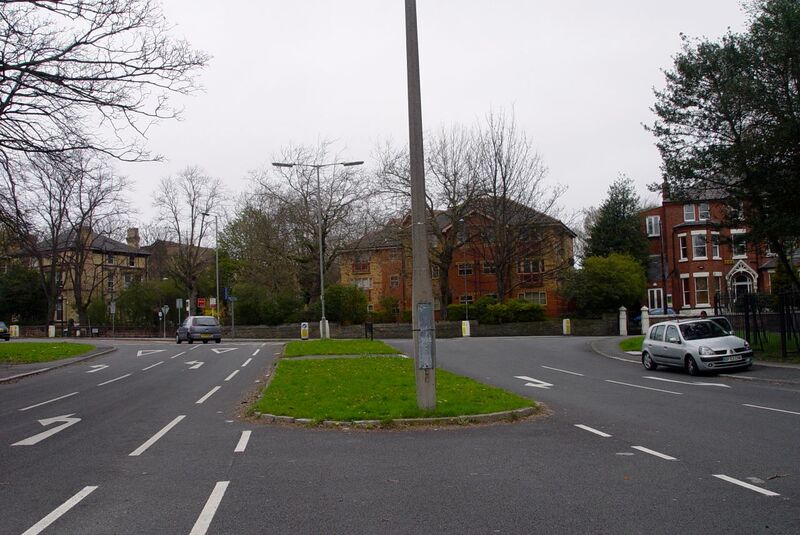 Post codes of course do not define districts and change from time to time not least along Ullet Rd. Just shows that estate agents know even less about Geography than whoever or whatever it was made up the post codes. Post codes are just for the convenience of the Post office in delivering letters and were never intended to relate to old Liverpool Districts. As I said, they do change over time in some districts. A good example is the old Dingle Oil terminal site in Toxteth. It was L8 and is now L17 and so of course has again been dubbed as being in “Aigburth” now that it has lots of new houses which couldn’t possibly be in the Dingle !! Yes, I remember them doing that and that’s not about convenience for Royal Mail. More like, as you suggest, anti-L8/Dingle prejudice when it came to selling the developer’s precious houses. Very fascinating, Ronnie. I’m sorry the church is gone, but I love the picture of your granddaughter learning to play the drum. Priceless! She was beyond delighted to discover you could whack something very hard, make a loud noise, and everybody would be pleased with her! 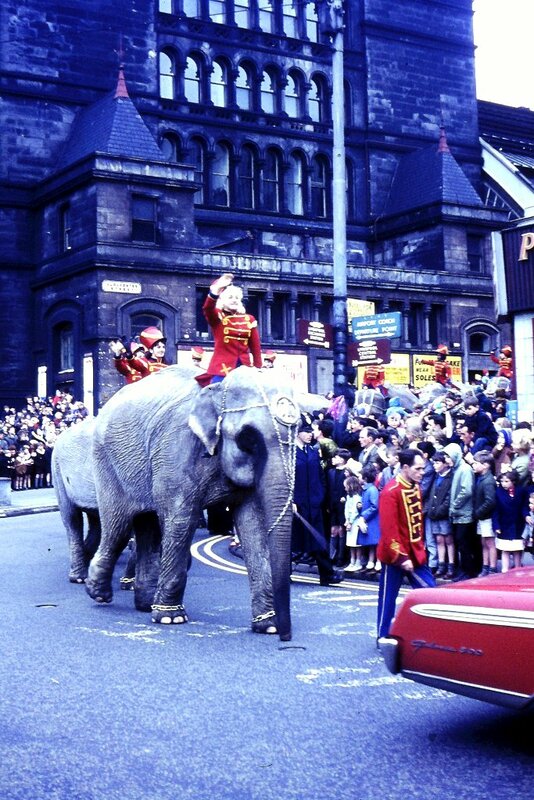 The picture of the elephants walking in stately procession from Lime Street Station is priceless so is the one of Ellie beating the drums – you can feel her joy. The old adage “every picture tells a story” is certainly true here. Pity that nice church has gone leaving nothing of great interest behind. Excellent stuff once again ! 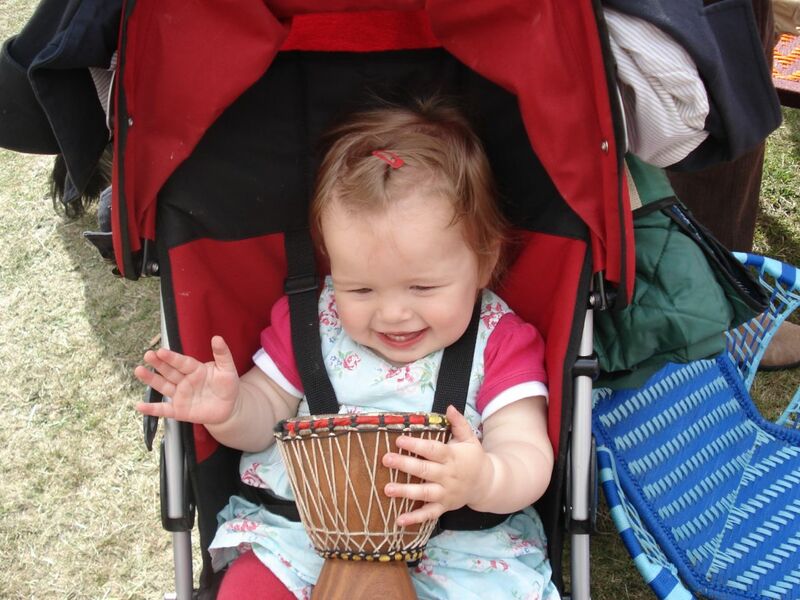 I’d bought Ellie her own, much smaller drum at the previous year’s festival(added to the post). So she was delighted to find really big ones!